Headdress to Impress | Crockett Foundation - Tag In & Help Out! 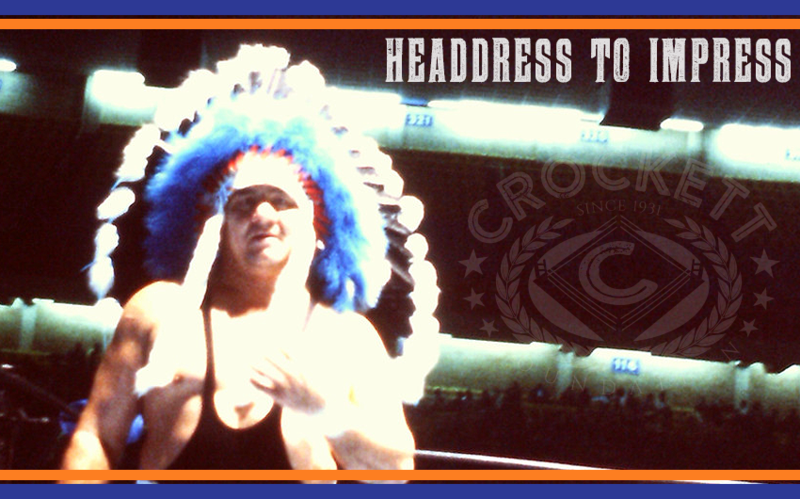 Wahoo McDaniel….Two words that could put the fear of God in any warm blooded human being. Wahoo was a force of nature both in and out of the ring. His presence in the ring was legendary but out of the ring he was quite legendary in another way. As a kid walking through the offices of Jim Crockett Promotions, you always knew that danger lurked around every corner. Wahoo was the reason for much if not all of the trepidation. You see Wahoo liked to pick things up and throw them. Namely children. Walking around a corner and finding yourself suddenly flat on your back on a couch was just the norm. There was no reasoning. No running. It just was what it was. There was no one to complain to…….except Elizabeth E. Crockett. Elizabeth “Lib” Crockett was Jim Crockett, Sr.’s widow and was quite the force of nature herself. Lib packed a lot of punch in her 4’10” frame and could not care less how menacing you thought you were. On one particular occasion, it was Wahoo that had to worry about what lurked because as he threw one of her grandchildren in the air and summarily busted the top of the child’s head open, it was Lib that came around the corner. Fear came across his face as Lib pulled him down to her level and explained to him how that better not ever happen again. Wahoo apologized profusely as he back pedaled down the hall. But don’t kid yourself, the torture did not end he just looked around the corner first. There were pluses to having him around though. A major plus was that he was the only reason I passed my driving test as a teenager. That’s right…Wahoo McDaniel single handedly got me my license. Growing up around police officers and security officers gave me respect for but no real fear of men and women in security uniform so the fact that the State Trooper that got into the car for my driving test was less than chatty didn’t even show up on my radar at first. The driving test continued, as they do, and it started to dawn on me that this Trooper did not think I was cute or funny, let’s be honest all teen girls think they are cute and funny, and this was about to go down very badly. After about 2-3 minutes of listening to grunting, moaning and groaning out of the man in gray, I pulled the car over and asked him if there was a problem. He took a long deep breath and turned to me in what I am sure now was going to be the tongue lashing of my lifetime. Then out of nowhere the clouds parted and the sun came out….Wahoo’s headdress was in the backseat of the wood sided station wagon. I would not have even noticed because it was certainly not unusual for something being left in one of the cars for one reason or another but the Trooper did. His eyes opened wide and gleamed like the sun itself. He asked what the object as his voice cracked a little. I of course told him and explained a few reasons why it could be back there. As I reached in the back seat and handed it to him as he almost giggled like a school girl. I then pulled the trigger on the what I knew was going to get me a damn license. I asked him if he would like to wear it….that’s right put it on his head and wear it like a boss. He did and chatted like a little school girl the remainder of the test. Wahoo McDaniel… Two words that could put the fear of God in any warm blooded human being but put a big smile on a State Trooper’s face and by God a driver’s license in my pocket. Loved going to see Wahoo and Dusty in Tampa at Ft Homer Armory. What a wonderful story, about both Wahoo AND Mrs. Crockett. We are thoroughly enjoying these posts!